If you’ve been away from the internet for the past couple years, allow us to fill you in on one of the more recent e-commerce trends of selling handmade/vintage goods. This niche market includes goods like repurposed vintage wear all the way to custom-made suitcases and taps into a consumer’s sense of ‘individuality’. With more and more consumers looking for ways to separate their sense of style from the pack, websites that focus primarily on the sale of vintage and hand made goods, set themselves in a good position to leverage this trend; but is that all this is? A trend? Isolating for searches in the United States between 2004 till present we noted an overall downward trend in all of these terms and acknowledge that this does not bode well for purveyors of all things hand/custom made. It’s staggering how much greater Etsy’s Internet presence is over it’s niche market competitors; their searches do not even register in comparison. Excluding ‘Etsy’, we noted an uptrend from 2004 – 2011, followed by a considerable acceleration for ‘Big Cartel’ and ‘Storenvy’ in late 2012 early 2013, which we speculate could have been a response by users resorting to alternative platforms in anticipation of Etsy policy change in 2013. In either case, we note that since the significant spike in 2013, searches for all these platforms have either fallen or stalled. So if the search trends are pointing downward, can we infer anything about Etsy stock? 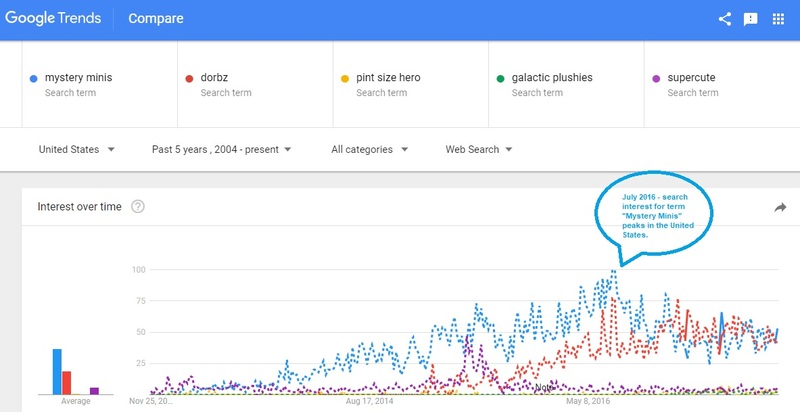 Financial Figures Confirming Google Trend? Etsy is fundamentally an e-commerce platform, whose revenue streams are derived from either it’s website or mobile platform. It’s financial fortunes are tied to it’s Internet presence and more so, it’s ability to drive Internet traffic. If Internet traffic to the website slows or stagnates, so will the company’s ability to generate revenues. The fact that searches are currently stagnating should be an alarming trend. This should be a red flag considering that the company on an annual basis is not even profitable and will need to increase its scale to reach break even. *Figure is based on an extrapolation of following year % increase and revenue figure. We acknowledge that part of the stagnation in the ‘Etsy’ search trend has to do with changes in Internet trends. More and more users are accessing content through mobile apps, and in the case of Etsy, in it’s annual MD&A for 2015, has disclosed 43% of all purchases came from mobile devices, meaning there are less users accessing the platform via search. The stagnating search trend may be partly related to users changing Internet habits, we still maintain concern over growth in key areas such as revenues, GMS, and active buyers/sellers and the confirmation provided by Google search trends. Etsy stock over the last two months has seen a ~20% appreciation in share price with numerous asset management outfits taking bigger positions with the expectations of positive things to come. In the world of stock analysis there are numerous approaches one can take in determining if a company is a viable investment, but when you have multiple financial figures pointing to a slow down in growth, not to mention the slow down in online presence, the rationale behind accumulating Etsy stock becomes increasingly unclear. As of the date of release of this article, neither the author nor TrendVesting maintain a position (long or short) in Etsy (NASDAQ:ETSY). We remind all readers to review our ‘Disclaimer’ page shortly after reading this article.